I wonder what you think worship is? Is your view of worship, too small? Worship is giving God alone (Psalm 19v2), glory due His name in the beauty of His holiness (1 Chronicles 16v29), with reverence. This is where through the use of the mind and the senses, honour and respect are directed towards God, “in spirit and in truth” (John 4v24)! Worshipping in Spirit involves the whole person – mind, body and will. Worshipping in truth means that all true worship reflects God’s character. The Christian Church has 2000 years of worship resources, all of which can be used in modern Church services, and not just the latest songs! Worship in a church service should be an intimate, dynamic and holy encounter with God. Firstly God commands it, as 1 Chronicles 16v29 reminds us “Give to the Lord the glory he deserves! Bring your offering and come into his presence. Worship the Lord in all his holy splendour”. God deserves worshipping for He alone personifies goodness (Psalm 100vv4-5), mercy (Exodus 4v31), holiness (Psalm 99v5,9) and power (Revelation 4v11). God is to be worshipped in obedience to Him as creator (Revelation 4v11), Saviour and Lord (Habakkuk 3v18). Worship brings exuberant satisfaction (Romans 12v2; Colossians 3v24). When was the last time you had worship like that!! And of course worshipping with others in a church is worship! But it is only part of worship, and certainly not the full meaning of worship! Does that surprise you? Worship is not just on the Sunday, or individual acts during the rest of the week! Worship, in the wider biblical sense of the word, for the Christian is to be an active dynamic relationship with Jesus Christ and seeking a life of total obedience and submission to Him. True worship of the living God involves total obedience to His ways and not just singing songs. For the ancient Israelites, sacrifices were an innate part of their life and worship structure. Yet as Samuel said: “Behold, to obey is better than sacrifice, and to heed than the fat of rams.” (1 Samuel 15v22) What he is saying is that God prefers life obedience rather than acts of worship. Obedience and submission to God is true worship of Him! By seeking to obey Him and submit your life to Him, that is true worship of Him. Worship is to be to God alone! Yet sometimes preachers and other church leaders are raised to an unhealthy status of reverence that is unbiblical. It is as if they are being worshipped, rather than God, to whom you are exhorted to obey and submit to. So go! Go obey and submit your life to God and make your whole life as an act of worship to Him! God shows no favouritism (Romans 2v11). God is eternally just and righteous. It is a reflection of His mercy, that nobody can claim God is unfair. Jesus Christ will judge the whole world with justice (Acts 17v31). People are destined to die once and after that to face judgment (Hebrews 9v27). What is common to all people, is a universal sinfulness (Romans 2v1). What is in the murderer or the thief is in all people, everywhere and of all time. That is sin and it must be judged. Judgement will be before the Great White Throne of Judgment (Revelation 20v11-15). Judgement covers both unbelievers and believers! Judgment of unbelievers - Those who do not profess Jesus, as God, will be judged according to their sinfulness. They are already guilty, because they didn’t take up the offer during their earthly life. These people will be cast into the lake of fire with satan and his angels (Revelation 20v15; Matthew 25v41). This punishment is eternal (Matthew 25v46). Judgment of Christian Disciples - And that is not all! Those who are believers, Christian disciples, and are actively engaged in a relationship with Jesus Christ, will also be judged! Does that surprise you? While these people have accepted God’s free offer and are declared righteous by faith, they will be judged according to the things they have done with, and in, their faith. Belief and faith is to be supported by good works (Galatians 5v6; James 2v18). As a Christian Disciple, you will not be judged for sin - this has been judged (Isaiah 53v4-6; 1 Peter 2v24), and you have salvation on that basis! This judgment is not for your salvation but for your crown! As a Christian Disciple, you will be asked to give an account of yourself (Romans 14v10), and you will be judged according to what you have done (2 Corinthians 5v10). The quality of your work will be tested (1 Corinthians 3v11-15) and your motives exposed – either you did things for God’s glory (1 Corinthians 4v4-5) or you did them for your own glory. So, go this day. Go this week! Go tell somebody of the crown waiting for them, if only they are willing to enter into a living and dynamic relationship with Jesus Christ! Remember - do all you do, for God’s glory and not your own! Partake - Words In Scripture Explored – Sovereignty of God. G’day! 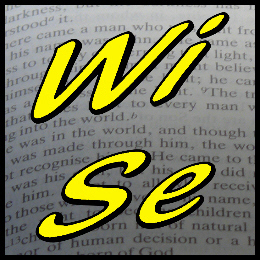 Welcome to WISE. The word for today is Sovereignty of God. The sovereignty of God means that God is in control at all times and nothing can occur outside of His control and will. God loves His creation and cares for it. He won’t deny people their humanity when dealing with them. Sovereign decree: When God says “Eternal life is available for all. You may choose to accept or reject it. Those that accept it, I will call my children.” Your own reaction as a Christian Disciple is that you have taken up God’s offer and are trusting and obeying. Natural decree: When God has created a lemon tree, that lemon tree wont produce potatoes.” Our reaction should be to plan in view of that. A question often posed is one that goes “Well if God is sovereign, then why doesn’t He do something about the suffering of the masses such as those in who are dying for lack of food?” But God has done something about it! God has provided enough food for all people everywhere, just that we in the West are greedy! So the problem is not with God, but with people! God’s provision to all people has become God’s provision for the minority, through humanity’s inhumanity to others. As for other kinds of suffering, that’s part of the reason for the cross, where God Himself experienced human suffering when Jesus died on the cross: Jesus, the man who was both fully God and fully human. God is not so removed from our sufferings, which He Himself endured and suffered at the Cross. Just because God allows free will to all people to sin, doesn’t mean that God is responsible for the sin – that is, and must remain, people’s responsibility! If not, we would all just be robotic automatons instead of free people. God’s sovereignty is inclusive in that it covers all actions of people, good or bad (Acts 2v23; Ephesians 2v10). The foundation of God’s sovereignty is wisdom according to Paul (Ephesians 3:8-11). So, when we are faced with a decision, God knows what is going to occur. He knows all the options and choices. It is important when faced with making decisions to pray about it and read the Bible. He seeks you to respond to Him with love and affection. Why not start today, and ask Him for help? God is interested in every facet of your life. If He were not, then He couldn’t be personal, and He certainly wouldn’t be sovereign! For some of us the only time we see or hear the word redemption is on a supermarket or magazine coupon, which unless used for its specific purpose, has a redemption value of 0.001p. In the Old Testament, the idea of a redeemer is found in the story of Ruth and Boaz, which climaxes with “So Boaz took Ruth into his home, and she became his wife. When he slept with her, the Lord enabled her to become pregnant, and she gave birth to a son. Then the women of the town said to Naomi, “Praise the Lord, who has now provided a redeemer for your family! May this child be famous in Israel” (Ruth4v13-14). That baby was Obed, the grandfather of David, an ancestor of Jesus Christ. Redemption was also a familiar word in New Testament times, because its main use was to refer to the buying back of a slave - the price paid to buy the slave’s freedom. A slave had no possessions of their own to sell in order to buy their freedom – they would always be dependent on somebody else to do that. But it is the humans’ responsibility to choose that way! God does not coerce forcefully – He leaves it as a choice for humans to make as individuals. For as one of the Church Fathers, Augustine, wrote: “For no one is redeemed except through unmerited mercy, and no one is condemned except through merited judgement.” Redemption is not just about looking back to the cross. It also means we are to live a life worthy of the cost paid by Jesus Christ. That means we are to actively live a life of total dependence upon, and total obedience to, God. That is the best way to show you have accepted God’s offer of redemption – a life being transformed into the very image of the Redeemer, Jesus Christ.